The Techcircle SaaS Forum 2015 had a vibrant audience comprising leading investors, top industry executives and entrepreneurs. While the day-long event, held in Bengaluru on September 23, largely discussed the various facets of Indian software-as-a-service (SaaS) companies, the last session of the day had three promising SaaS startups showcasing their products to the audience. Experts at the conference opined that the domestic market for enterprise IT products is not mature enough yet and therefore, Indian SaaS companies should aim to become global players. CADashboard: Developed by MindChipps Consulting Services, CADashboard is a communication, collaboration and compliance management platform for chartered accountants (CAs), company secretaries (CSs), legal professionals and small and medium enterprises. It helps professionals take control of the regulatory compliance processes and assists them to focus on the right areas to act on potential risks due to delays in compliance adherence. 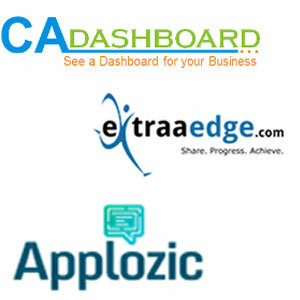 It claims to have more than 1,200 CA and CS firms managing work for around 45,000 customers on the platform. PotentialEdge: PotentialEdge, a product owned and operated by ExtraaEdge Technology Solutions Pvt Ltd, is a platform that helps educational institutions acquire students. It seeks to fix the unorganised student acquisition system in the country and help organisations to understand the online and social behaviour of students, which is the key to selling courses. Applozic: Applozic Plug & Play lets companies add a messaging or chat facility into their mobile apps and websites quickly without the need to develop or maintain any infrastructure. It helps companies save cost and time in building their own chat/messaging service. In addition, an integrated feature like this prevents users from moving to external messaging apps like WhatsApp and losing analytics data. The messaging feature can be integrated within a company's mobile app or website. It targets companies in the e-commerce, real estate, education, and gaming sectors. Applozic plans to enter the US market by the end of this year.